Baldwin Gardiner was an important importer, retailer, and sometimes manufacturer of household goods. According to Deborah Waters, formerly Curator of American Decorative Arts at the Museum of the City of New York, in 1815 Baldwin Gardiner married Louise-Leroy Veron, sister of Louis Veron, with whom he was in business in Philadelphia from 1817 to 1826 as a retailer of household wares. In 1827, Gardiner left Philadelphia and set up a "furnishings warehouse" at 149 Broadway, New York, where he remained in business until 1836, before relocating first to 39 Nassau Street in the fall of that year, and then to California in 1848. Baldwin Gardiner's "furnishings warehouse" was stocked with a wide variety of imported goods, including porcelain, glass, lamps, and chandeliers. For important silver commissions, he occasionally turned to Thomas Fletcher, former partner of his late younger brother Sidney Gardiner of the distinguished Philadelphia silversmithing firm of Fletcher & Gardiner, to fill an especially demanding commission. 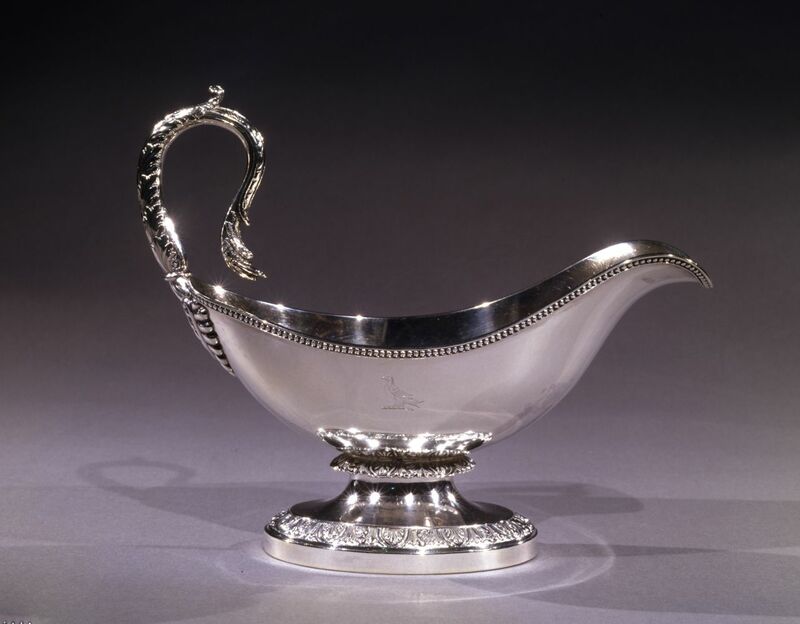 This stunning Sauceboat with Serpent Handles was presumably made in Baldwin Gardiner’s own shop, which, stylistically, must not have been long after he established his own silver work rooms about 1831. The extraordinary quality of the piece and its considerable weight suggest that the person who ordered it from Baldwin Gardiner desired an ultimate example of his craft.